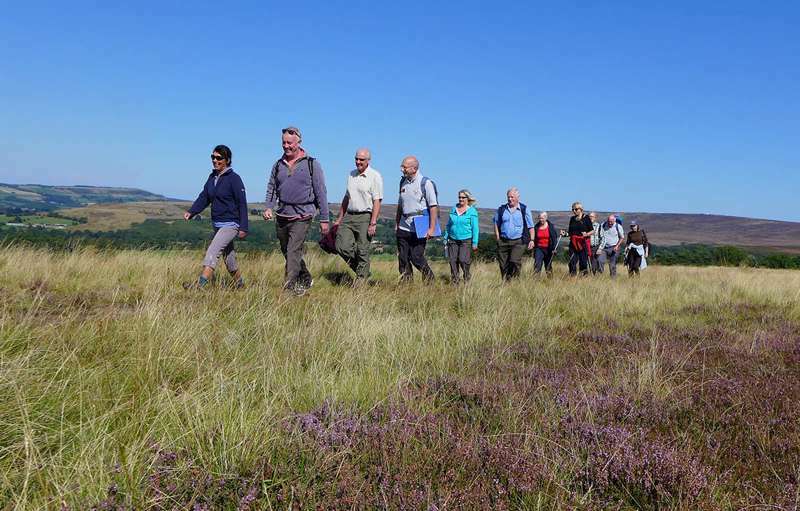 The Hole of Horcum, Roseberry Topping, Beggar’s Bridge, the Old Salt Road – they are all fantastically atmospheric names, and each is one of many alluring destinations during WalkFest (May 22–25), the inaugural walking festival hosted by the North York Moors National Park. This is my local National Park – where the moors meet the sea, just north of York – and even though I’m clearly biased, it’s a fantastic place to explore on foot. Here’s my pick of North York Moors’ walks – each one part of the festival programme – with a few tips on places to stay and things to do along the way. The climb up the North York Moors’ most distinctive (all right, only) mountain is a true classic. It’s around 1,000 feet high, which doesn’t sound like much, but you’ll soon see why locals call it the ‘Yorkshire Matterhorn’. For a view from afar, head over later to Lord Stones Café and Restaurant at Lord Stones Country Park. The views from the escarpment here to Roseberry Topping and the moorland Captain Cook Monument are immense – and there’s camping and glamping on site too. Whether Robin Hood himself ever set eyes upon ‘Bay’ is still open to debate, but this charming coastal village was certainly once a smuggling hotspot, with contraband passed up from shore to moor via secret tunnels and hidden passages. The festival is offering smugglers’ tales and a village walk in the company of the Baytown brewer, plus a few beers into the bargain afterwards. Check out the Swell Café if you're feeling peckish. There are few more romantic sites in the North York Moors than this 17th-century packhorse bridge in Glaisdale, built for love by a local boy made good. The walk from here through the woods to Egton Bridge is a beauty, following an ancient stone ‘trod’ or pathway. The whole Esk Valley is something of a charmer too, and nearby, hiker-friendly Bank House Farm Hostel makes a great budget base if you want to stay off the beaten track. Goathland – village star of Heartbeat and Harry Potter – is great for walking, whether on the old railway line down to Grosmont, to the local Mallyan Spout waterfall or out to Wade’s Causeway and the so-called ‘Roman road’. Don’t miss the North York Moors’ smallest and quirkiest pub, the Birch Hall Inn at Beck Hole, while there are good accommodation options at nearby Pickering, including the elegant B&B 17 Burgate. You can use The Moors National Park Centre at Danby – in the heart of the Moors – as a base for all sorts of walks, from family strolls to all-day moorland hikes. But give yourself the best of both worlds by staying the night by the sea in Whitby. It’s only 25 minutes’ drive from the visitor centre, and it has some great accommodation, whether it’s the dramatically sited clifftop YHA Whitby or the idiosyncratic La Rosa hotel. WalkFest runs from 22 to 25 May 2015. You can find more information and a schedule of festival walks at www.northyorkmoors.org.uk/walkingfestival. Jules Brown keeps his eye on northern England for Cool Places, and also blogs about travel and travel-writing at www.julestoldme.com. Photo credits: Volunteer Brian Nicholson, Chris J Parker, Mike Kipling, Colin Carter.